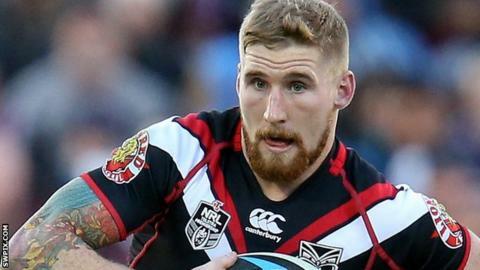 Sam Tomkins says he is still open to a return to Wigan Warriors in the future. The 25-year-old full-back moved to New Zealand Warriors for a world-record fee last year after helping Wigan to a league and Challenge Cup double. "It's somewhere where I'd never say I'd never want to go back to, so at some point in the future it's very possible," Tomkins said. "I'll never say never. I'll always be a Wigan fan even if I'm not playing there. I love the people, the town." After announcing his move to the NRL, Tomkins said he could not picture himself playing for another Super League club should he return to England. After his spell in rugby union, Tomkins' brother Joel returned to Warriors this season from Saracens. "As soon as Joel signed they were saying 'oh that must mean you're coming back', but for the time being I'm happy playing at the (New Zealand) Warriors," Tomkins told BBC Radio Manchester's Rugby League Extra. "Watching it as a fan, I'm waiting on results and seeing where it puts Wigan in the league - I've been much more interested in Super League than I have been watching the NRL. "When you're playing you're concentrating so much on your own game and who you're playing you're not to bothered about other results." Tomkins scored 13 tries in his 21 appearances in his first season at this new club but they finished outside the play-off places in 11th.